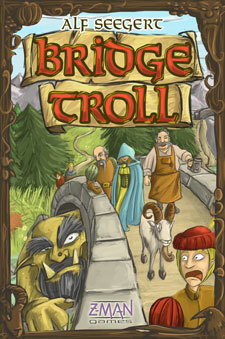 The premise of Bridge Troll, a recently released board game from Z-Man Games, is a spin on the old fairy tales: the players are all trolls, extorting tolls from travelers or, depending on your preferences, saving them for food. Of course, you’ve got to watch out for knights and bandits and dragons, as well as the three Billy Goats Gruff. Alf Seegert, the game designer, asked if I would like to try the game out, and I was happy to oblige. Just based on the theme, I was expecting a fairly light strategy with a lot of troll humor. After all, this is a game in which the player who grunts most like a troll gets to go first. But I was surprised to find that the gameplay itself was more complex than my expectations, and there’s more to Bridge Troll than goofy illustrations. Speaking of goofy illustrations, the artwork for the game, done by Ryan Laukat, is excellent. It’s hand-drawn and looks like it would fit in a kids’ fairy tale book, which is appropriate. The six different trolls each have their own personalities and my gaming group enjoyed picking which troll to use and then—in the spirit of the game—mocking everyone else’s choices. The object of the game is to collect the most “bridge points,” described as the improvements you make to your bridge so that travelers will come your way. You pay for bridge points with a combination of tolls extorted from travelers and food eaten (to give you energy for building, of course). 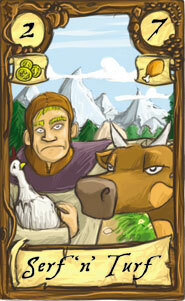 The travelers are represented by cards, and each is worth a certain amount of money <i>or</i> a certain amount of food. For example, the Peddler is worth more money than food, but the Serf ‘n’ Turf (a peasant with a cow) is worth more food than money. (Why can’t you simply eat the traveler and then take the money? Well, it wouldn’t be a fairy tale without some arbitrary rules, would it?) There are some special travelers too, like the Garlic Merchant who helps you scare away the dragons and bandits, or royalty who are worth a lot of money if you happen to also grab a Royal Messenger to collect the ransom. The number of travelers per round is determined by a weather die: the sunnier the weather, the more people are out traveling. Then each troll secretly bids a number of “boulders” (little wooden playing pieces) to determine who gets to pick a traveler first. There are also advantages to bidding zero and shutting down your bridge for the day—it allows you to collect more boulders, at the cost of forgoing the travelers. A large part of the game’s strategy comes down to the bidding, because the order in which you receive traveler cards can really make or break you. If you have to go last in a round, you may end up forced to take a dragon which takes away your highest card, either food or money. But the way you bid also affects how many boulders you’ll get back to use for the next round. It’s a tricky balance, getting enough travelers to trade in for points, and keeping enough boulders to defend your bridge from the Billy Goats Gruff and other dangers. I loved the idea and the theme, but sometimes it did seem like the connection between the gameplay and the story was a little stretched. How does bidding with boulders really affect how many travelers come to your bridge, for instance? 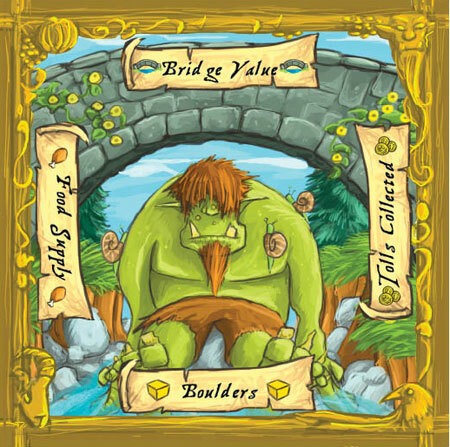 There’s a rule that you can only use one color of boulder when you bid, which obviously affects strategy and gameplay (for the better, in my opinion), but what does that mean, exactly, in the world of trolls and bridges? Granted, all games have some level of abstraction from the theme to the actual mechanics, so this is not a big complaint, but I wanted to remark in case you were picturing something more along the lines of beating your chest and battling other trolls. The actual strategy is much more, well, civilized. I played this a few times with various numbers of players, and have really enjoyed it. My regular gaming group gave it a thumbs-up and I think it’s one that we’ll see returning to the table often. 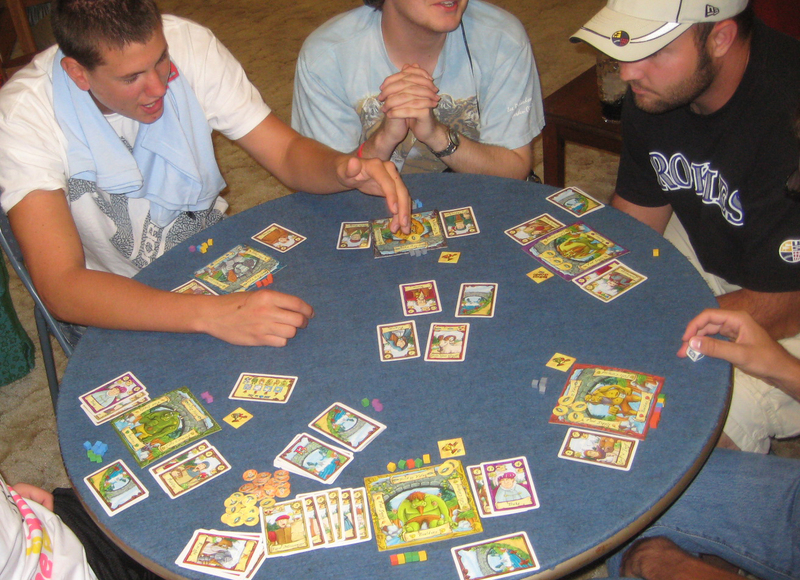 The game fits three to six players, and is recommended from ages ten and up. I had just teens and adults playing, so I’m not sure how quickly younger kids would pick it up, but I think they’d still enjoy the troll theme.